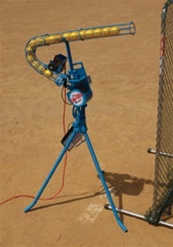 Make your batting practice more productive or just have more fun with the Jugs Lite Flite Automatic Ball Feeder. The Lite Flite Automatic Feeder works with Jugs Lite Flite Baseballs. The Jugs Lite Flite Feeder automatically release a pitch every 6 seconds making batting practice very easy and efficient. Made of durable lightweight steel, the Lite Flite Feeder is both safe and simple to operate, is easy to set up, and attaches directly to the pad bracket, and no tools are required. Only one power source is needed to run both the Jugs Lite Flite Machine and the Lite Flite Feeder.